Tough yet satisfying, ALONE... is a challenging endless flyer with some suitably sensitive controls. 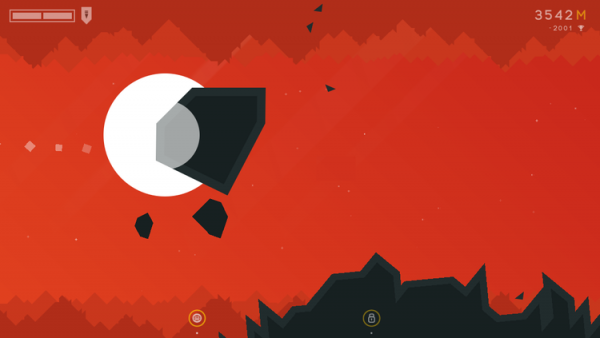 Simplicity is the key to ALONE..., which makes sense for a game from the makers of PUK. Similarly, while it’s easy to learn, it’s far from easy to be particularly good at - but that’s what works so well. We can all grudgingly admit that endless runners are rarely taxing. That’s part of their appeal. Switch your brain off and enjoy, progressing a reasonable distance without much effort. 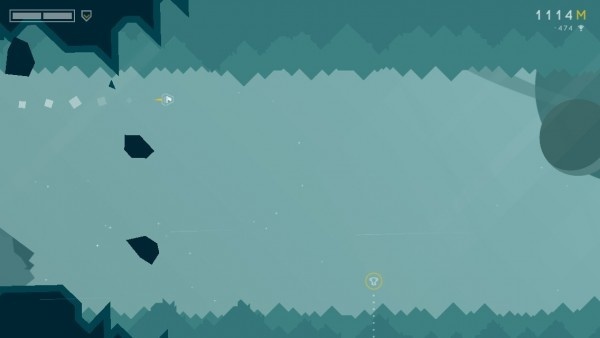 ALONE... is an endless flight game, and far from one that you should switch your brain off for. It’s tough but ultimately quite satisfying. Flying through caves, the landscape switches from manageable to narrow and tricky to negotiate. It’s telling that the first mode to be available is called Veteran and described as Hard, rather than the usual easy or medium. Along the way are numerous pieces of debris falling from the sky. You can survive a couple of hits but run into the wall and it’s game over. Controls are twitchy and sensitive, with finger taps up or down dictating your direction. The default setting offers inverted controls, but I found things slightly easier by switching them around. Throughout each session, a bar at the bottom of the screen lets you know when you’re about to surpass your last run’s score or when you’re nearing someone on the leaderboards. It’s a relatively small detail but an important one in giving you that competitive urge to do better every time. That’s precisely what keeps you playing ALONE.... And as you progress, you unlock new difficulty levels with the potential for bonus modes - if you’re good enough. ALONE... dispenses with anything like an upgrade system or challenge model, something that many Endless games enjoy, but that’s because it’s not really needed. It keeps things pure and frantic. It might not be the deepest of affairs, but that doesn’t stop it from being a compellingly tricky challenge for twitchy gamers.